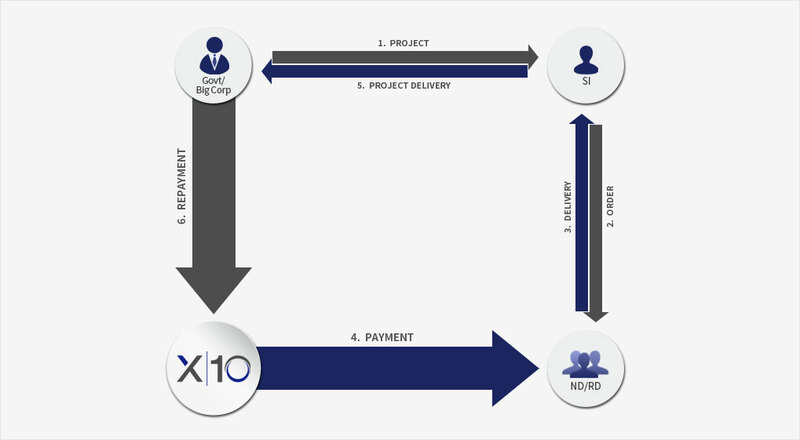 X10 Financial Services offers channel partners in various supply chains quick and easy access to financing programs and options including working capital loans, extended net terms and accounts receivable schemes. The business model uses strong data analytics, credit best practices in supply chain lending and a deep working knowledge of the distribution business to create unique liquidity programs. 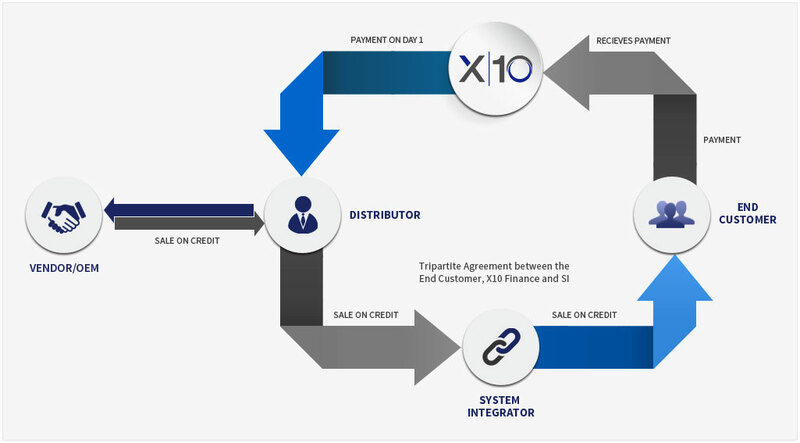 X10 Financial Services is different from other credit providers in the supply chain industry since it offers tailored solutions that are based on the special working capital needs of its customers. Our objective is to help them expand their profit margins and grow their business. At X10, we offer a financing strategy with flexible options that can help mitigate risk, help in better management and organization of cash flows, and minimize overall costs. With financing from X10 Financial Services, your business can make use of cash to finance and support other strategic initiatives too. X10 Financial Services Limited works closely with its clients to help them find the right solution according to their needs. By constantly evaluating our partner relationships, we make sure to adapt and evolve to meet their business needs. 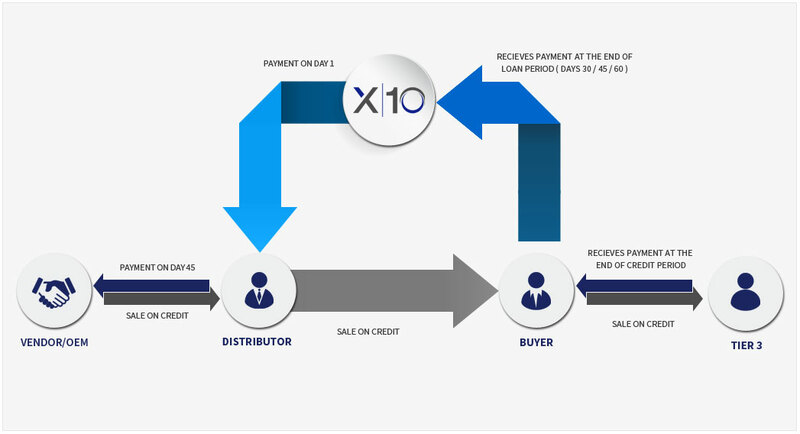 The lending products offered by X10 Financial Services include Reseller Finance and Vendor Finance. Vendors/Original Equipment Manufacturer (OEM) bills to National Distributor (ND), who bills further to System Integrations (SI) on a Back to Back basis. X10 Financial Services Limited pays the ND on day 0 and extends a loan to the SI. Escrow account is opened as per a Tripartite Agreement between X10 Financial Services, SI and the end customer. The payment from the end customer flows into the escrow account on due date. This account is operated jointly by X10 Financial Services and SI. In order to secure the transaction, a post-dated cheque (PDC) is taken by X10 Financial Services from the SI. Loan granted for personal use with end use of funds being monitored. These loans offered are unsecured in nature. The loans offered are advanced on the basis of the borrower's credit-history and ability to repay the loan from personal income. Repayment is through fixed amount instalment over a short fixed term. Financial Assistance for purchase of material from Approved distributors/OEMs pertaining to supplying for specifically approved projects by X10 risk committee. 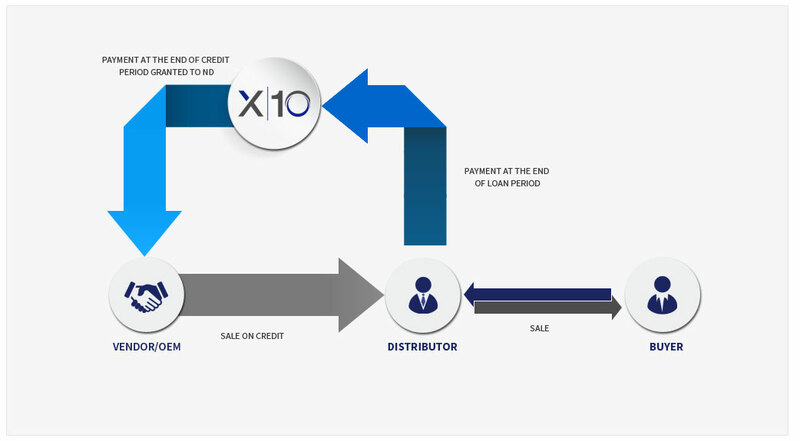 The repayments from the end customer or the SI to be collected either directly by X10 or into an escrow account. Payment to be made directly to the Supplier/ ND/ OEM, after confirmation from End Customer/ SI that material has been received in satisfactory condition i.e. proof of delivery to be furnished prior to funding.